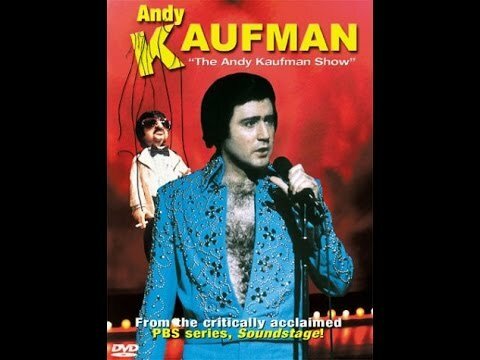 In this video release of a 1983 episode from the critically acclaimed PBS series Soundstage, oddball comedian and satirist Andy Kaufman is featured in one of the last performances before his untimely death in 1984. Considered by some critics and fans to be a Dadaist, and known for blurring the borders between his stage persona and his “true” personality, Kaufman inflicted a brand of humor that was unique, sometimes slipping beyond comedy into performance art — or mental illness. Here his format is the late-night talk show, and his sidekick is a marionette of his alter ego, obnoxious dive-lounge comedian Tony Clifton. Also included in the show: Kaufman reprises his Foreign Man character, impersonates Elvis Presley, seems to expose guest Dr. Alex Schorr as a fraud, and apparently has a genuine argument with his former girlfriend Elayne Boosler.